A long time ago, in a galaxy far far away, there exist a social media analytics company called ‘PostRank‘. It was launched in mid 2007 and was acquired by Google in June of 2011. PostRank Analytics was one of my favorite analytics tool and I used this tool, almost as long as it was available to publishers. PostRank was one of the best tools to identify and measure social engagement and top influencers. It tracks the RSS feed content performance in the social world. PostRank has the ability to track users’ engagement in real time, no matter where the engagement take place and it can also aggregate social engagement data. At the time of its launch, it was one of its kind tools. Now there are many tools out there which more or less do, what this tool did. But what make this tool so special, is that, it was acquired by Google. Not only Google acquired the company, but they also relocated the PostRank team to Google’s Mountain View headquarters. to work alongside them. Not only Google acquired PostRank but killed it, as a publicly available tool, so that no one, other than Google can benefit from this technology. Now, why talk about a discontinued tool? Though PostRank has gone in its present form, it is still very much alive as a patent technology in Google. So I will continue to talk about PostRank in present tense. It is worth noting that, Google launched the social reports in Google Analytics only after this acquisition. So there is a strong possibility that some of the PostRank technology powers the Social Reports in Google Analytics. Through Google acquisition of PostRank, and its official statement about the acquisition, one can safely conclude that, this acquisition was carried out, to understand social sharing and how it can be used in the ranking of web pages. So by studying, what PostRank did as an analytics tool, to identify and measure social media engagement, we can get an idea of, what Google do today, to identify and measure social engagement. Engagement refers to the attention other people pay to your published content, like blog posts, news & articles. They see and read a post, and then because it’s interesting, inspiring, or controversial, they get “hooked” and decide to take further action. Getting hooked and acting on it when you read something that makes you think, laugh, or get angry is engagement. Engagement events are the activities performed by a user after he/she has engaged with your website contents. Social Bookmarking (via Diigo etc). So whenever a user performs one of these activities, an engagement event is triggered which is then captured by PostRank. For example, one tweet is counted as one engagement event by PostRank. One comment is counted as one engagement event by PostRank. So if your blog post got 50 tweets and 3 comments ,then total engagement events associated with your blog post = 50+3= 53 . Now the real life example. Screenshot from PostRank Analytics tool interface. These engagement events are simply a sum of: 225 tweets, 23 comments, 54 delicious bookmarks, 4 sharings on Hacker News etc. 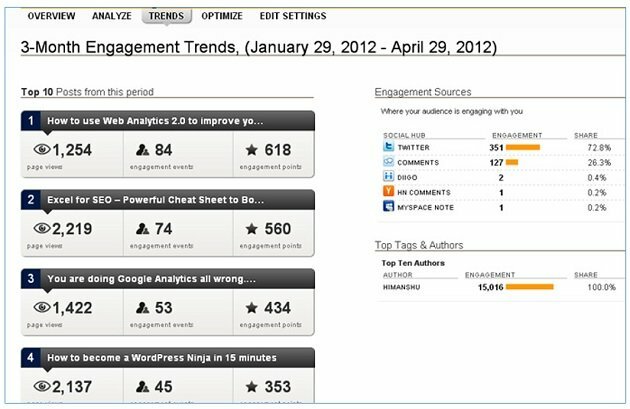 One important thing to remember here is that, this article was published in ‘December 2010’ but PostRank continued to store and show this engagement data until it was acquired by Google in June of 2011. Google record and store historical social engagement metrics for each piece of content it can track. PostRank assigns a numerical value to each engagement event, known as Engagement Points. It assign different engagement points to different types of engagement events, on the basis of level of efforts required to engage with a piece of content. For example leaving a comment on a blog post requires lot more effort than just scanning (pageview) or tweeting the blog post. So PostRank considers ‘leaving a comment’ on a web page as one of the most engaged event. Consequently it assigns a very high engagement points to this social activity. On the other hand viewing/scanning a blog post requires very less effort in terms of engagement, so it is assigned low engagement points. ‘leaving a comment’ on a web page is one of the strongest signal of user engagement. A weak positive correlation between Engagement Points and other website usage metrics can be interpreted as the signal of poor social media engagement or worse sign of spam activity in social sharing. So if one of your blog post has got, say 100 engagement points but only 20 pageviews, then it means people are not really engaging with your blog post. Out of 100 people, only 20 viewed your blog post. The remaining 80 just shared the blog post, without reading it. #1 People shared your article on social media, for sharing sake. #2 People shared your article because you are an authority figure. #3 People shared your article because they want to provide useful information to their followers. Though they themselves, might not be interested in the shared content. #4 People shared your article only because they personally know you, from some conference or via other medium. Again they themselves, might not be interested in the shared content. How a piece of content can have 84 engagement events and 618 engagement points but zero pageviews? What that means, people are sharing contents but none of them bothered to look at what they are sharing. This clearly indicates that these engagement events/points are artificially inflated to boost social engagement. Google takes website usage metrics into account while calculating social engagement score. Google measures social engagement from several social media channels. PostRank sum up the engagement points earned from various social engagement sources to calculate the final score of a piece of content which is known as Engagement Score. Google calculates an engagement score for each piece of content. By measuring engagement trend, PostRank can detect how relevant your content really is, to your target audience. 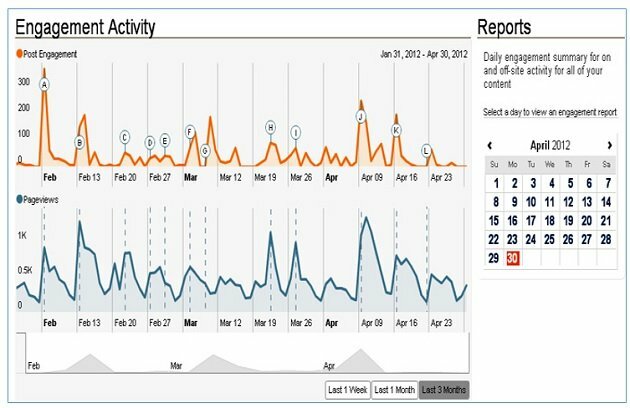 The engagement trend can also be used to detect spam activities in social sharing. If you continuously perform better on social media, you are very relevant to your target audience. Google can identify the audience which is engaging with your content and up to what level this engagement is. It can also find out whether the audience is human or bots, as bots’ level of engagement will be very different. 1. Google record and store historical social engagement metrics for each piece of content, it can track. 2. Encourage your visitors to leave more comments than tweets or other social shares on your blog posts, as comments get very high engagement points. 3. There need to be strong positive correlation between engagement points, pageviews and other website usage metrics, in order for real social engagement to take place. So spamming will most likely won’t increase your social influence, esp. in the eyes of Google. 4. Engage with your audience on several social networking sites instead of just one, to increase the overall engagement score of your contents. 5. Through engagement trends, Google can determine whether you are a one hit wonder or a real social celebrity. Engagement trends can help in separating the wheat from the chaff i.e. separating really useful websites from spam or not so socially active sites. Thus engagement trends can help in establishing the social authority of a website. 6. 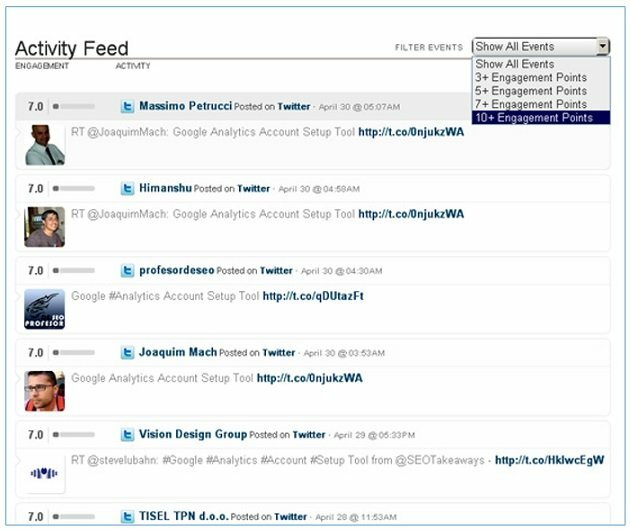 Google knows who is tweeting what, and how he/she is engaging with the tweeted content. That means ,Google has very good understanding of your audience, even without utilizing other users’ metrics, which are readily available in Google Analytics.